Ahhh! I can't describe how excited I am that Revlon came out with new lip stains. The Revlon Just Bitten Kissable Lip Stains are my hands down favorite lips products of all time. I have every shade. They are what started my lip product obsession. There are ten new Lacquer Balms shades and ten new Matte Balm shades and yes… I plan to collect them all. Hee hee. I'm not sure if they are limited edition or part of their permanent line. I picked up three all together. On a recent trip to Sephora I also purchased the highly hyped-about Too Faced Holiday palette, A Few Of My Favorite Things. If your thinking of getting it, you should! 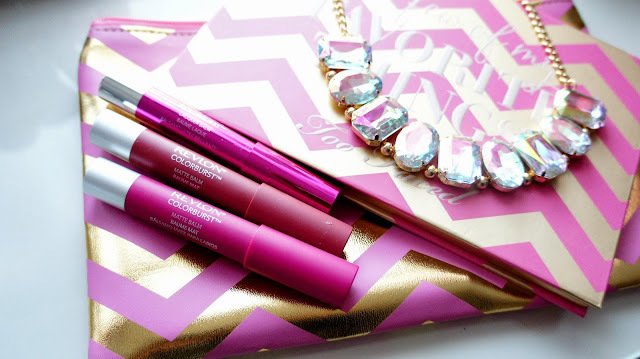 It is worth every penny and it comes with an amazing mascara. I couldn't wait to play with it and used it as soon as I got home that same day. I also used it on my latest Fashion/Beauty video. Watch me get ready from start to finish and pick up a couple of tips as I use some of my favorite products. A huge thank you to Coastal Scents for the sweet gifts. Oh my! How gorgeous is that two faced palette! Definitely adding it to my list. You're stunning!!! and LOVE your video! <3 I've just followed you on GFC, looking forward to your next post love! !